Echo Lake Entertainment & The Middleton Media Group will produce. Critically-acclaimed Turner Publishing’s novel is a contemporary dark fairytale about an anxious kid who falls into the terrifying realm of childhood nightmares. Echo Lake Entertainment (ELE) announced today that it has optioned Kathleen Kaufman’s dark fantasy novel, The Lairdbalor, from award-winning publisher Turner Publishing. Australian director Nicholas Verso (BOYS IN THE TREES) is attached to direct. Echo Lake’s Dave Brown is producing with John Powers Middleton and Alex Foster from The Middleton Media Group, and Helena Vilaplana who will Executive Produce. The producers are currently circling writers for the feature adaptation. The critically-acclaimed novel that, according to Kirkus Reviews, “conjures terrifying scenarios, with crisp, elegant prose” is Kaufman’s second novel and first with Turner Publishing. 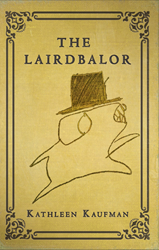 Following the journey of a boy who desperately tries to escape a nightmare shadow world with strange creatures, fears, and his own personal—and very real—nightmare, the Lairdbalor, the novel crosses genres of folklore, horror, fantasy, and magical realism. The novel is a deep exploration of the early origins of anxiety and fear for children growing up in a world in which they don’t conform. The Lairdbalor’s film rights were optioned on the heels of Turner’s announcement that they will be publishing Kaufman’s third book, Hag on October 2, 2018, a novel that follows a line of Scottish witches based upon Kaufman’s on personal family history. Verso is repped by Echo Lake Entertainment, Paradigm, and Marios Rush at Marks Law Group. Echo Lake Entertainment is a film and television production, finance and management company based in Beverly Hills, CA. Echo Lake Management represents established and emerging actors, writers and directors in Television, Film and Digital Programming. Their team of thirteen talent and literary managers is led by industry veteran Mike Marcus, one of the lead agents at CAA before becoming President and COO of MGM Pictures. In the expanding frontiers of television and digital, and in the changing structure of feature films, ELM’s entrepreneurial spirit and thoughtful guidance helps clients find new ways to succeed. ELM represents clients all over the globe and benefits from the reach and international success of the company’s production arm, Echo Lake Productions. The Middleton Media Group is the development, production and finance company of John Powers Middleton and Alex Foster. The primary mandate is to enable filmmakers and talent with a unique point of view, focusing on prestige material with worldwide commercial appeal. Founded in 2016, Middleton Media has been ramping up a new slate of projects including the cold war spy thriller A Most Dangerous Man with Studio 8, Seth Gordon’s inspirational drama, Life in Rewind, and the biopic on the visionary and computer pioneer Grace Hopper among others. John Powers Middleton’s credits include Manchester by the Sea, The Disaster Artist, The LEGO Movie, The LEGO Batman Movie, The LEGO Ninjago Movie, Spike Lee’s Oldboy, Run All Night, 2015’s Poltergeist, The Boy, Sleepless and A&E’s Bates Motel. Kathleen Kaufman is a native Coloradan and long-time resident of Los Angeles, California. She is a University of Southern California alum, teaches high school English, and is a writing and composition adjunct professor at Santa Monica College. In addition to writing, Kathleen is an avid amateur photographer and has published work in The Huffington Post and other publications. When not writing, she probably has a camera in hand or is curled up with a good horror novel. Kathleen currently lives in Los Angeles with her husband, son, terrier, and a pack of cats. Hag is her third novel. Nicholas Verso is an award-winning Australian director whose first feature, BOYS IN THE TREES, debuted at the 73rd Venice International Film Festival, screened at Toronto, Busan, and Sitges, and won Best Narrative Feature at the Austin Film Festival. His short film work includes HUGO, FLIGHT, and 2014 AACTA Awards Best Short Film winner THE LAST TIME I SAW RICHARD, and television work includes the Emmy award-winning NOWHERE BOYS, GRACE BESIDE ME, and SNAKE TALES. Verso is currently in the 2017 Churchill Fellowship and attached to direct the high concept horror film THE ICE CREAM MAN and will write and direct the psychological thriller SLEEP TO DREAM. Founded in 1985, Turner Publishing Company is an award-winning independent publisher based in Nashville, Tennessee with multiple New York Times best-selling authors. It has been named by Publishers Weekly as one of the fastest growing independent publishers in the nation. For more information, visit http://www.turnerpublishing.com.